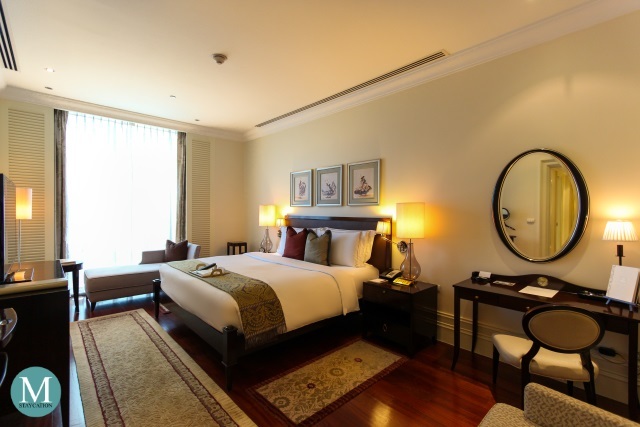 Raffles Makati (马卡蒂莱佛士酒店) is arguably the most luxurious and the most exclusive hotel in Metro Manila, Philippines. With only 32 suites, staying at this amazing property is a privilege in its own. 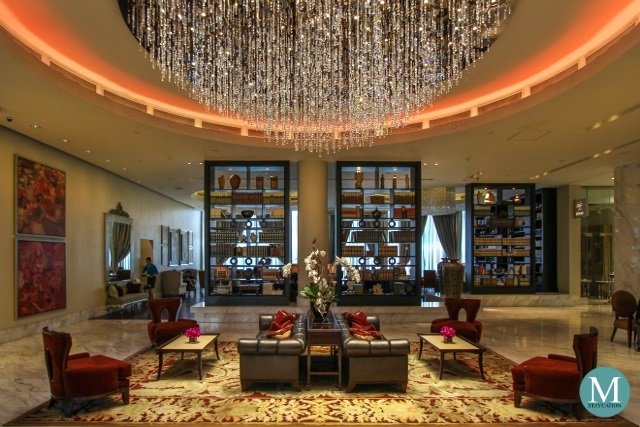 The very first Raffles opened in Singapore back in 1887, and it was in 2012, during the celebration of its 125th year anniversary, when Raffles finally established its presence in the Philippines through the opening of Raffles Makati. 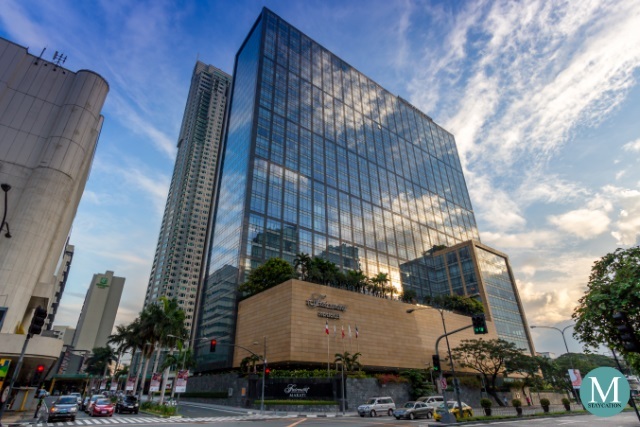 Raffles Makati is located in the Makati Central Business District and is surrounded by upscale retail and dining outlets, shopping malls and offices. 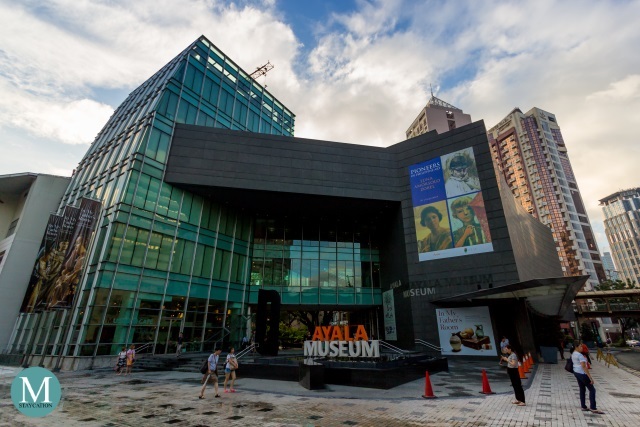 The hotel is easily accessible from Manila International Airport via the newly completed NAIA Expressway. 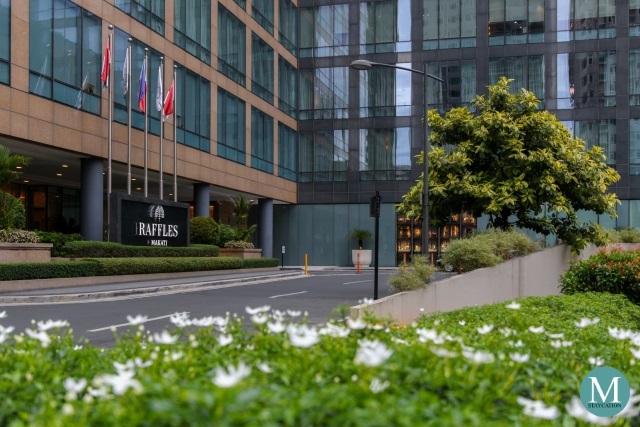 Raffles Makati is collocated in the same building as Raffles Residences and Fairmont Makati, with each property having its own lobby and reception areas. 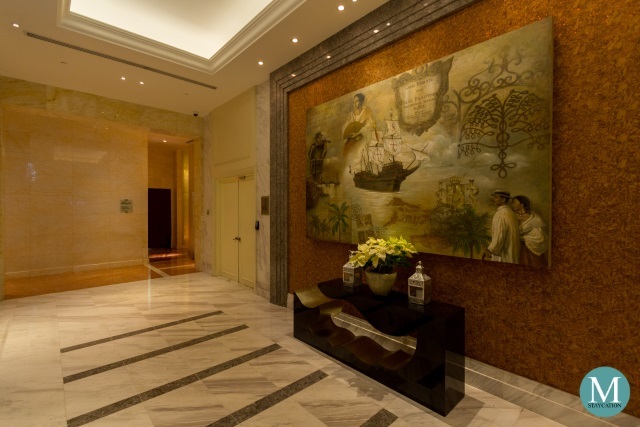 Raffles Makati occupies the 9th and the 10th floor of the building with its own exclusive express elevator. 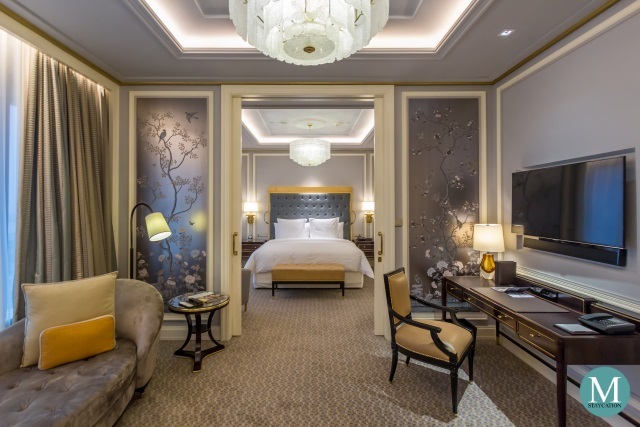 In December 2015, news came out that Raffles Hotels & Resorts, together with the Fairmont and Swissôtel hotel brands, will merge with the AccorHotels Group, creating one of the world's leading luxury hotel group. With this in mind, plus the fact that Raffles Makati was consistently ranked number one by TripAdvisor among all hotels in Metro Manila, it prompted us to start an annual tradition of spending Christmas at Raffles Makati. Raffles is an oasis for the well traveled, offering emotional luxury, says Diana Banks, Vice President for Brand of Raffles Hotels & Resorts, and guests will immediately experience such luxury through the in-room check-in and through the Raffles butlers who deliver the most gracious, skillful and highly personalized service. 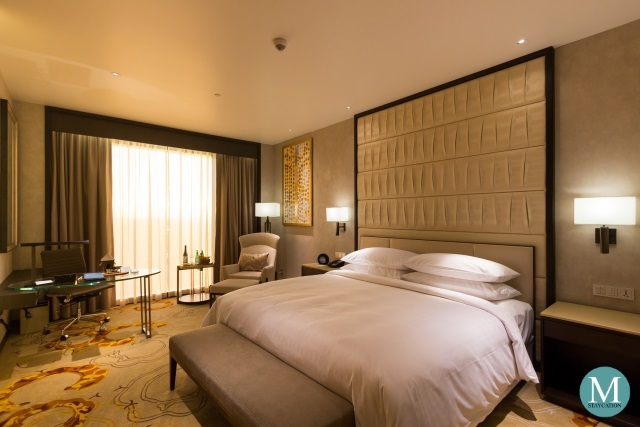 The 150sqm Presidential Suite (Check Room Rate) is the third and highest room category at Raffles Makati. 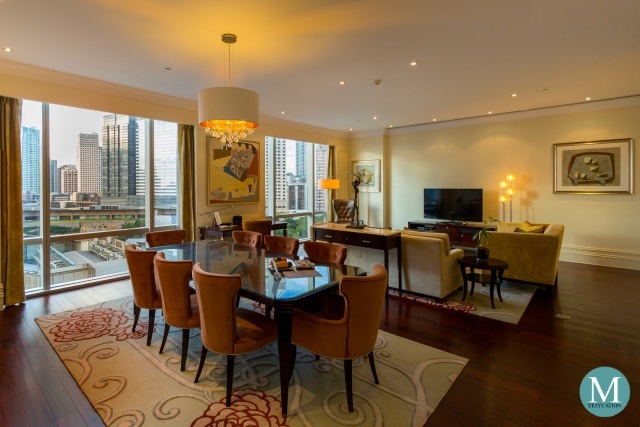 It features elegantly-designed living and dining areas, a fully equipped kitchen complete with microwave oven and refrigerator, an opulent master's bedroom with vanity area, a walk-in wardrobe and marble spa bathroom. 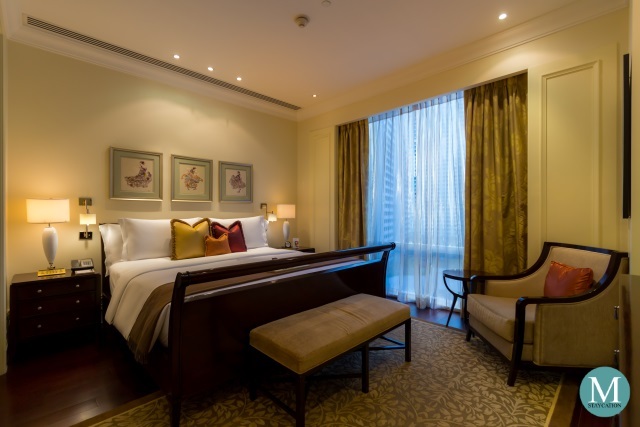 With a room rate starting at US$1,000.00 per night, the Presidential Suite at Raffles Makati should definitely be on top of a staycationista's wish list. 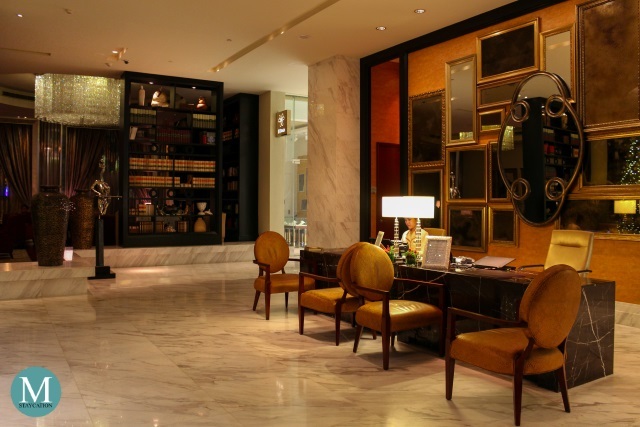 Writers Bar is one of the seven dining outlets of Raffles Makati. 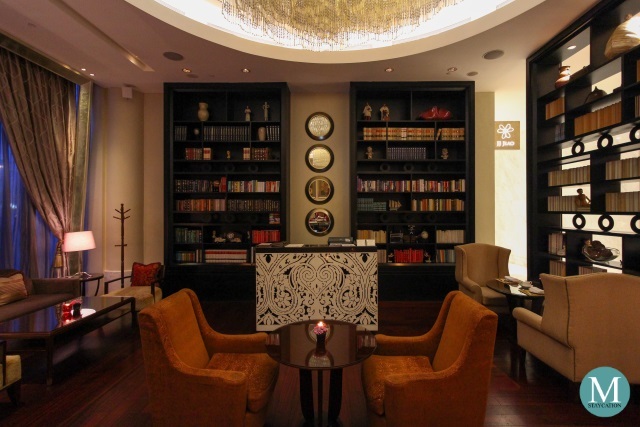 Functioning as the hotel's lobby lounge, Writers Bar is fashioned as a library to celebrate the various writers who have stayed at the original Raffles Singapore. 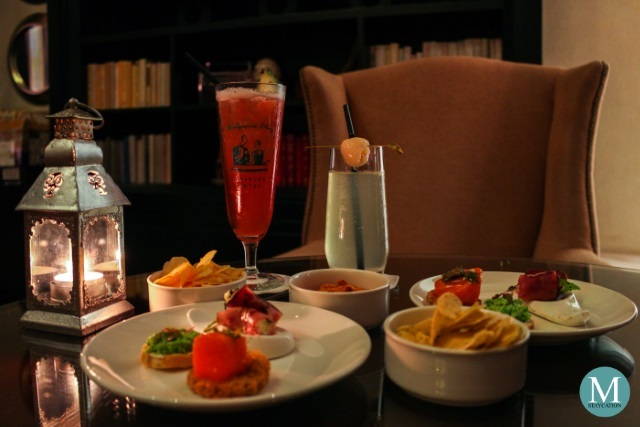 Guests staying at Raffles Makati enjoy a number of dining privileges at Writers Bar, including a complimentary Simply Classic Afternoon Tea for two persons. 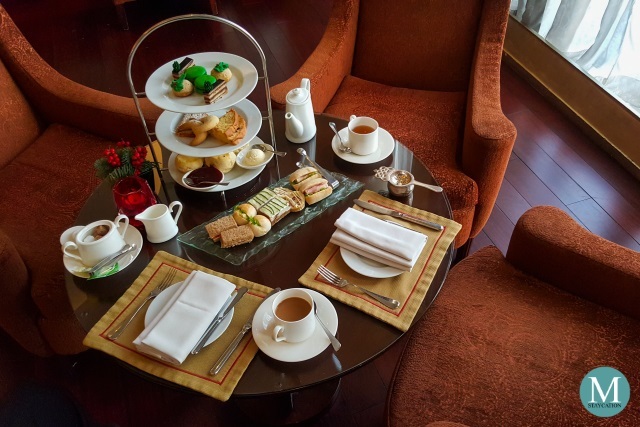 During our two staycations at Raffles Makati, we spent our afternoons here at the Writers Bar, enjoying every munch of scones, tea sandwiches and cake, and every sip of freshly brewed coffee and tea. Back in September 2016, we also tried out the New York State of Mind Afternoon Tea at Writers Bar. The afternoon tea runs from 2:30pm to 5:30pm daily. 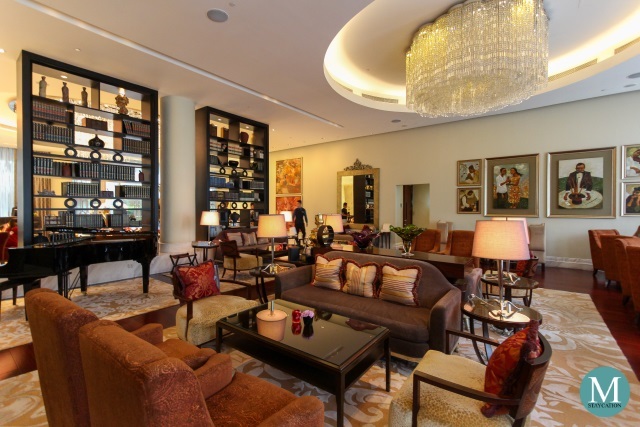 Aside from the complimentary afternoon tea, check-in guests at Raffles Makati also enjoy complimentary all-day refreshments at the Writers Bar. 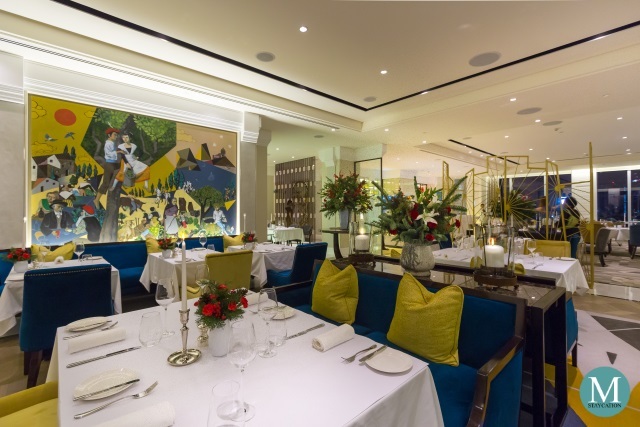 By 5:30pm, the Writers Bar transforms into an evening lounge where guests can enjoy their complimentary Pre-dinner Cocktails and Canapes. Writers Bar has an extensive menu of drinks including selected beer brands, wines, spirits, and mixed cocktails including the signature Singapore Sling. But if you are looking for a memorable experience during your stay at Raffles Makati, you should definitely visit the newly opened Mirèio Terrace. 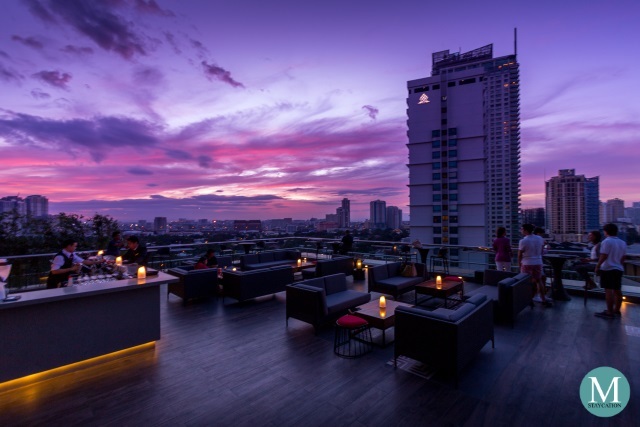 The best time to visit this rooftop lounge and bar is during sunset when you can witness the dramatic change of colors of the sky. During our most recent staycation, we've seen the sky turn from pink and purple to burning red and orange. And while you are already at Mirèio Terrace, you should definitely try some of the cocktails expertly created by the hotel's mixologists. Our top favorites are the Mirèio and the 1947. 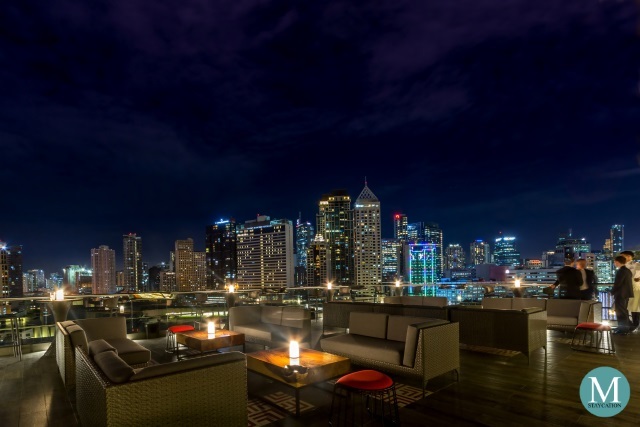 Mirèio Terrace is definitely one of the best spots in Manila to enjoy the dazzling cityscape. Don't worry if you won't be able to make it to sunset because Mirèio Terrace also has a stunning evening view of the city. End the day at Long Bar where you can slow down while enjoying classic Raffles cocktails such as the Singapore Sling and the Makati Luxury Sling, as well as other creative concoctions. Live music entertains guests every night until midnight. 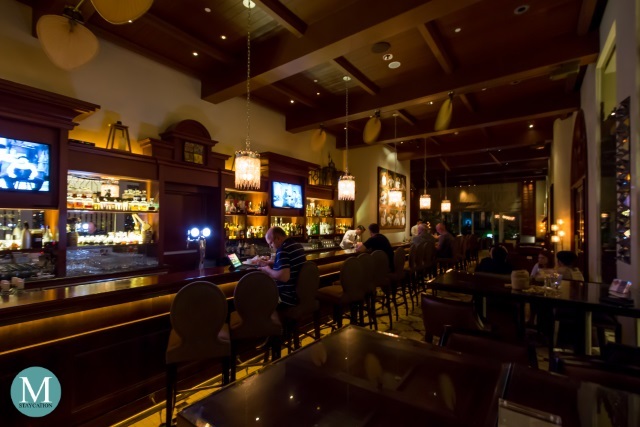 Long Bar is located on the ground floor and is open daily from 12:00nn to 2:00am. 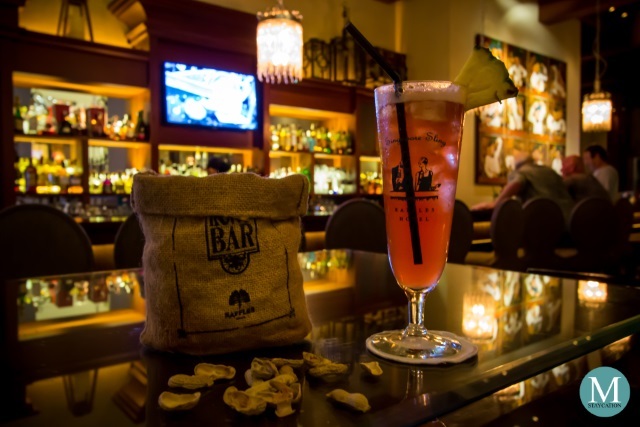 Long Bar is styled after the original Long Bar at Raffles Singapore, where the iconic Singapore Sling was born. Fans of this well sought after drink can very well relive their Raffles Singapore experience here at Long Bar Raffles Makati. 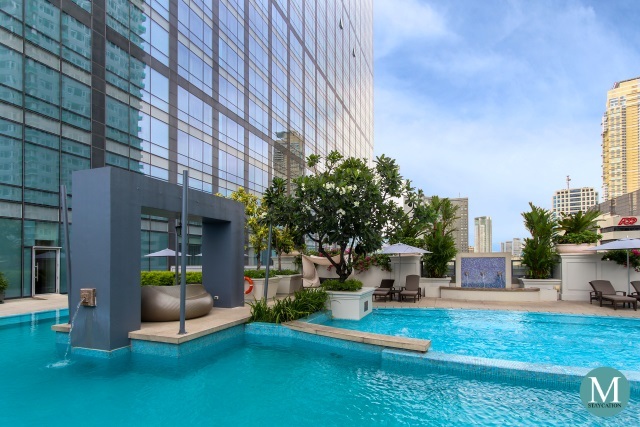 Guests staying at Raffles Makati (Check Room Availability) also enjoy the privilege of using both the Raffles Makati and Fairmont Makati swimming pools. 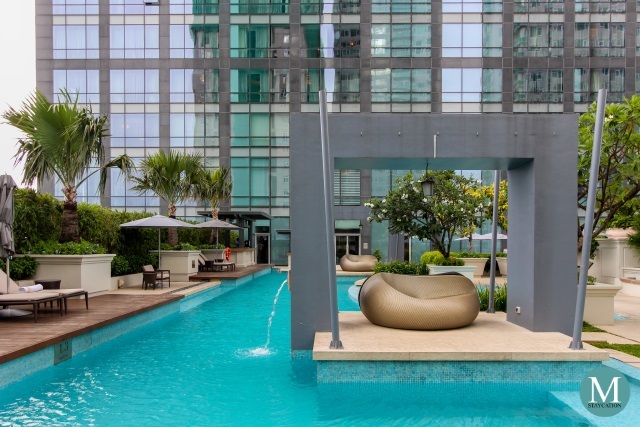 We highly recommend the swimming pool at Raffles Makati as it is conveniently accessible from the 9th floor, the same floor where the suites are located. 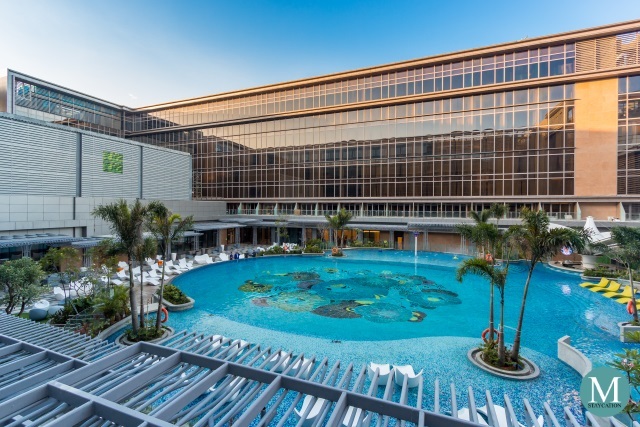 Compared to the swimming pool at Fairmont Makati, the swimming pool at Raffles Makati is also less crowded as it is for the exclusive use of Raffles Makati guests. Best time for swimming is in the morning before breakfast or in the early afternoon after checking-in to the hotel. 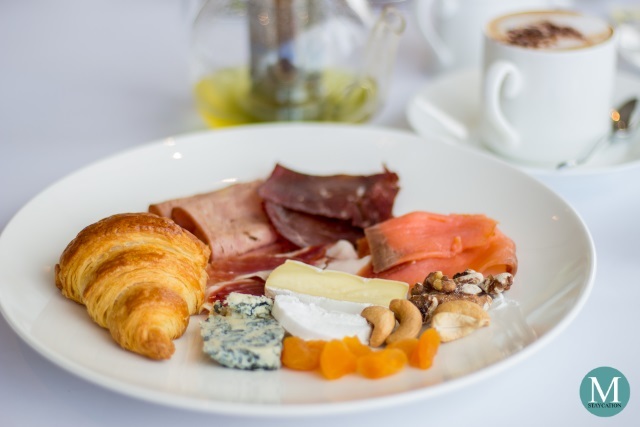 With the opening of Mirèio, guests at Raffles Makati now has the option of having buffet breakfast at Spectrum or a deluxe continental breakfast at Mirèio. 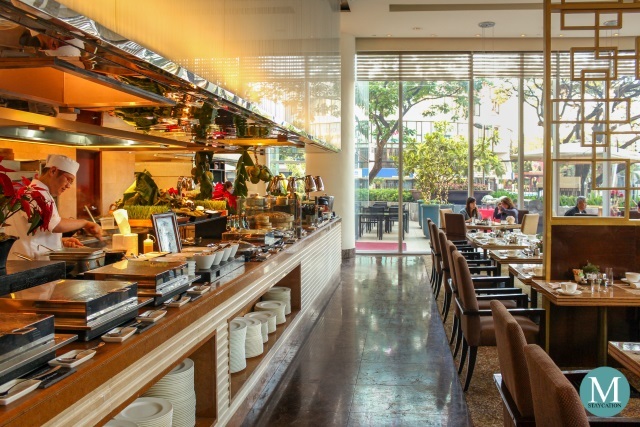 Spectrum is the all-day buffet and a la carte dining restaurant of Raffles Makati and Fairmont Makati. It serves a good mix of Asian, Filipino, American and Western dishes during breakfast. There's also an egg station, breads and pastries, cereals, fruits, cheeses and cold cuts. 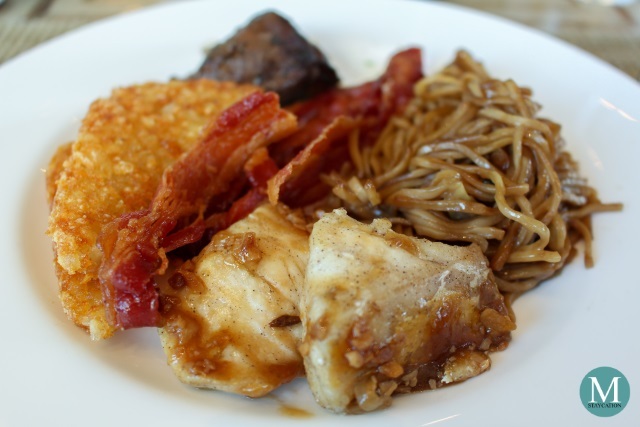 We had our Breakfast Buffet at Spectrum during our first stay at Raffles Makati in 2015. We started quite early to avoid the Fairmont crowd. By 8:00am, Spectrum will already be on full seating, especially during weekends, and you will have to queue and wait for a table to become available. During our most recent staycation at Raffles Makati, we opted for the Deluxe Continental Buffet Breakfast at Mireio. Mireo has a quieter, slow-paced vibe compared to the very busy mornings at Spectrum. Mireio also has more than enough tables to accommodate all the guests staying at Raffles Makati (Check Room Availability). 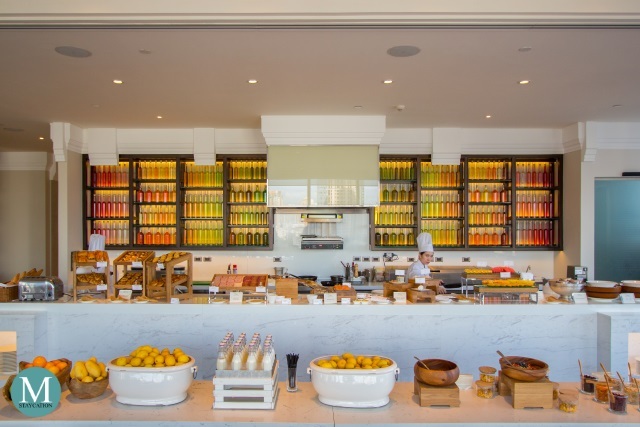 Mireio serves premium continental breakfast items in a buffet set-up. The spread included cheeses, cold cuts, smoked salmon, and even freshly sliced Iberico ham. There's also cereals, fruits and salads. Mireio also serves authentic French pastries. In fact, as soon as you enter the restaurant, you will be welcomed by the aroma of freshly baked breads. The croissants were amazing. They were flaky and mildly buttery, and tasted exact way I remembered the croissants in Paris. 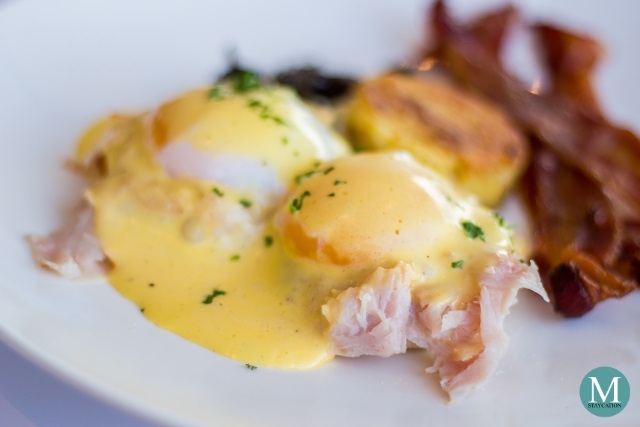 In addition to the deluxe continental buffet breakfast, guests can also choose one a la carte dish from Mireio's breakfast menu. Choices include omelets, crepes, pancakes, French toasts and Asian breakfast items served with rice. We had the Eggs Benedict with Parisian Ham and the Beef Tapa with Papaya. 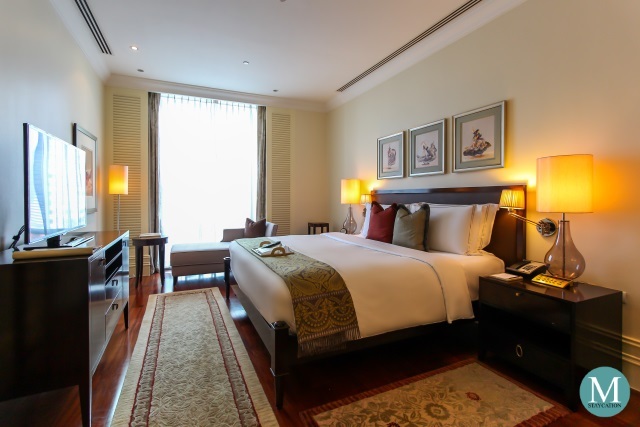 Unlike most of our hotel features which narrates our staycation experience on a first impression perspective, this feature on Raffles Makati is a product of our various visits and stays at this property. Each stay was unique, and each stay left an impression in us. 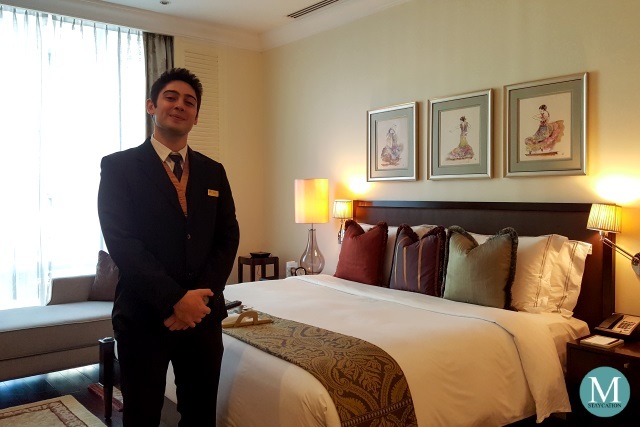 More than the obvious aspects of a luxury hotel, what sets Raffles Makati apart from other hotels in Metro Manila is the tremendous amount of personalization they provide. This has brought about a lasting memory of our stay.